As we all know that GST launched in India and it replaced all previous taxes (like VAT etc.). GST is the only tax that is applicable after 01st July 2017. With GST all the online store owners are in trouble because of the doubts about tax slabs and they don’t know that how to integrate GST with their online store portals. This module helps WHMCS users to overcome the initial problems that have arisen due to GST. WHMCS does provide tax rules options where you can configure your GST tax but we have some additional features in our module that make it stand out /unique and necessary to use. 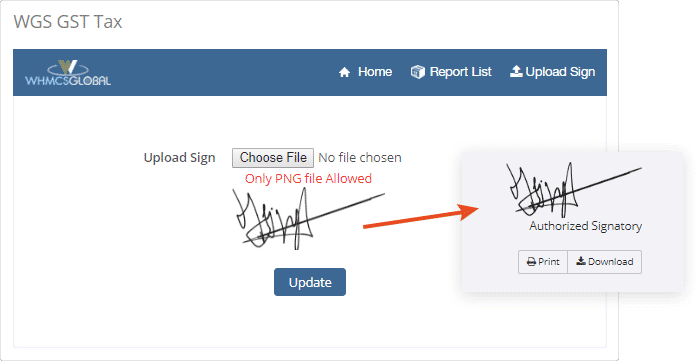 Below are existing features list and we are continuously working on adding new and improved features. All the tax rules and custom fields that are required for GST will be automatically set up with the help of our module. Our invoice format meets all the requirements of GST as it has all the things that are mandatory. 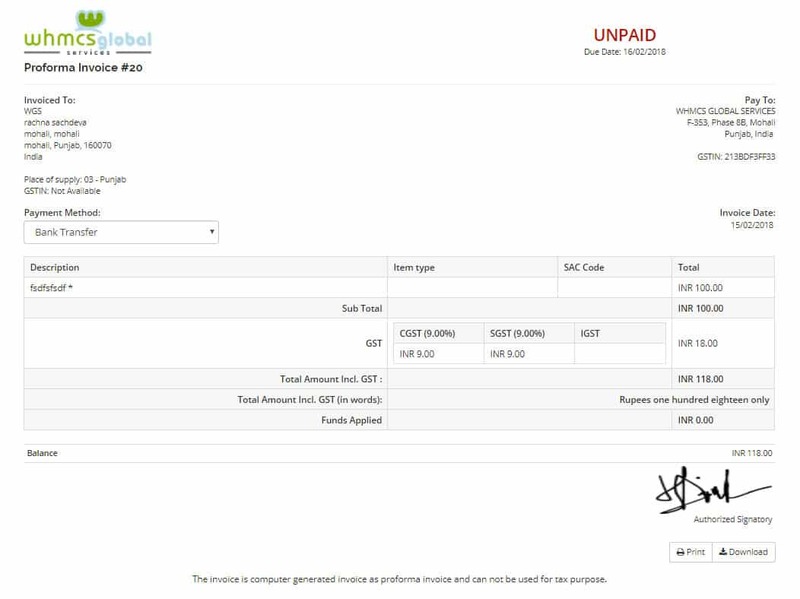 For detailed information, you can view the format of invoice in screenshot section. 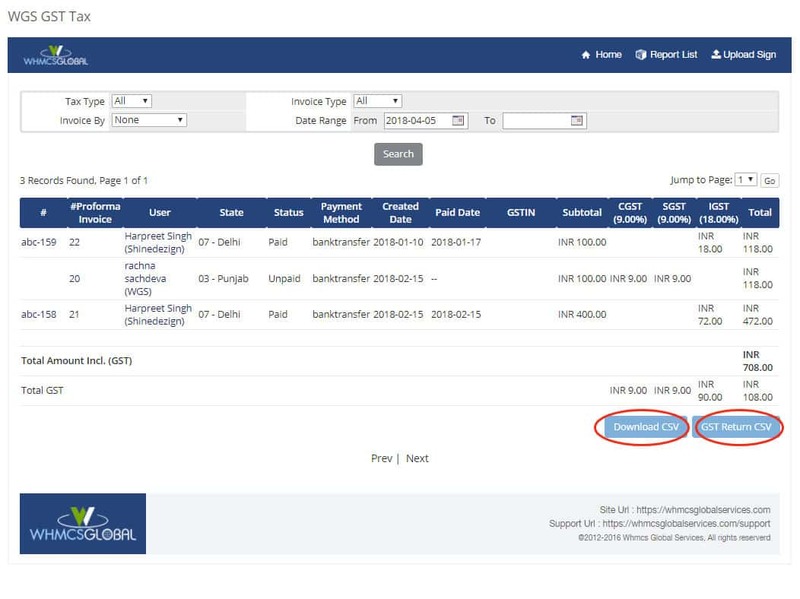 We have integrated an option to add your previous tax labels that will be applied on invoices before 1st July 2017 and on latest invoices, it will be applicable as GST. All you need to enter your previous tax labels in our addon configuration. 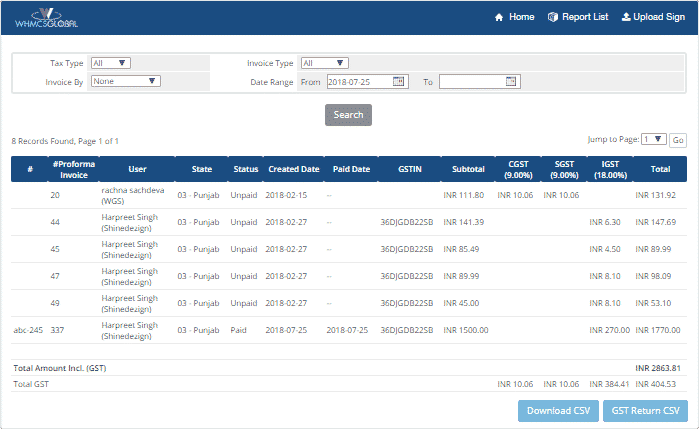 All the transaction details as per GST will be shown under report section and you can download it in CSV format. 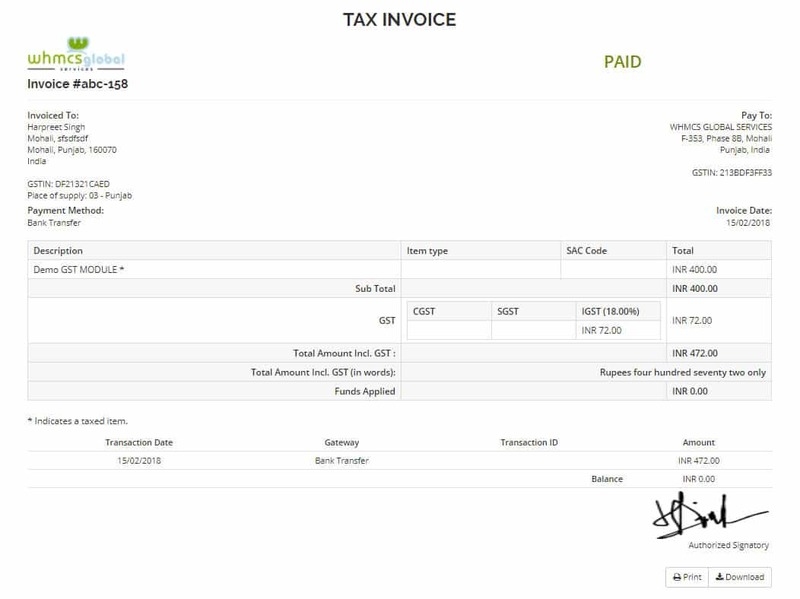 You can apply basic filters like date range, Tax type and Invoice type as well. SAC codes are mandatory to have in your invoice for each product. 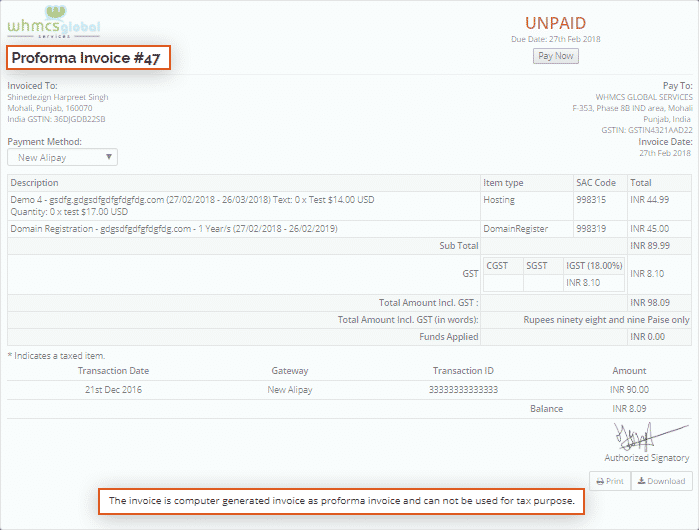 They are added dynamically into invoice. 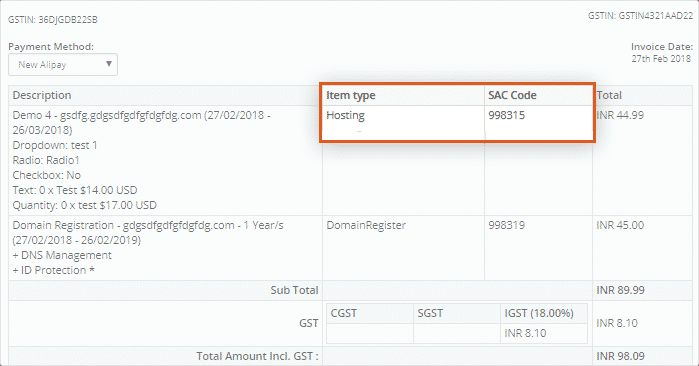 E.g If user has ordered hosting service then it will show SAC code specified for the hosting service and if Domain Registration then different SAC code and so on. 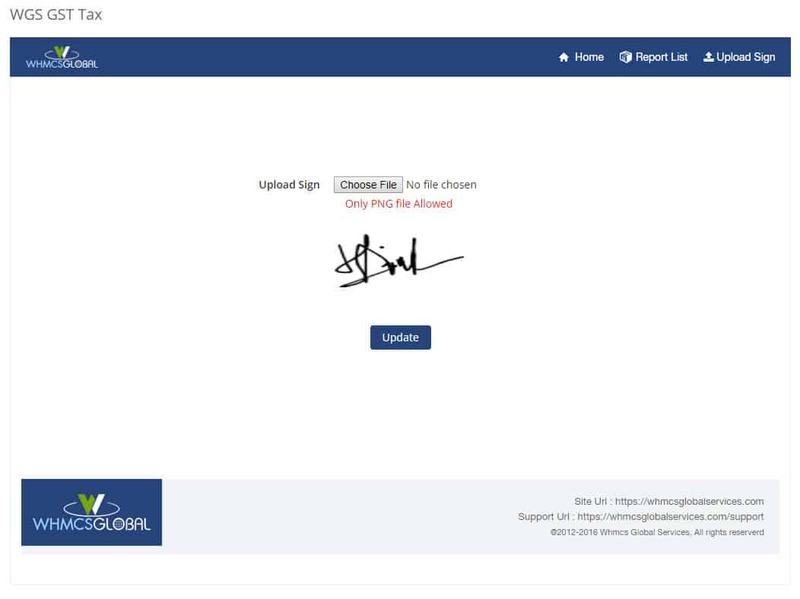 In addon there is an option to upload your signature image and that will be shown on all invoices.You can use a third party website like http://onlinesignature.com/draw-a-signature-online to create your signature and download image from there and upload it through our module. New quotes and performa invoices are as per GST compliance. Their module is good but buggy. 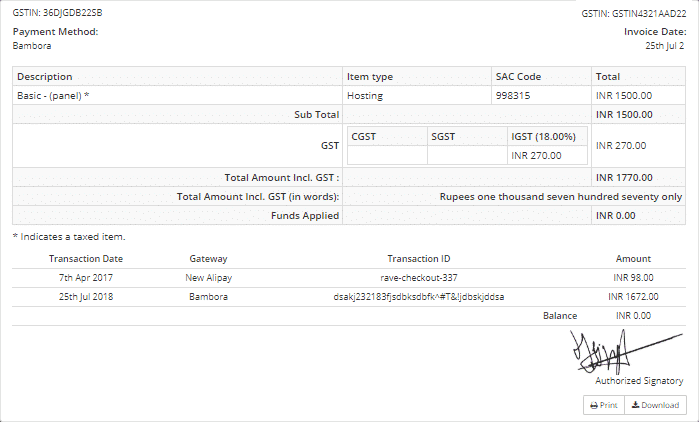 If you want to raise an invoice by your own it will not generate Item Type and SAC code and the place will remain blank. Even after payment of the invoice, it wont get reflected, which is a big problem in GST. Also, the place of Supply field too won't show up. When opened a ticket with them they asked for money for debugging, never faced such unprofessional people in the commercial plugin development. Most Wanted WHMCS Module for GST is here. Thanks to WHMCS Global Services & their module GST WHMCS Module For India. Special Thanks to Manvinder and Harpreet :) I really loved the simplicity of the Module. 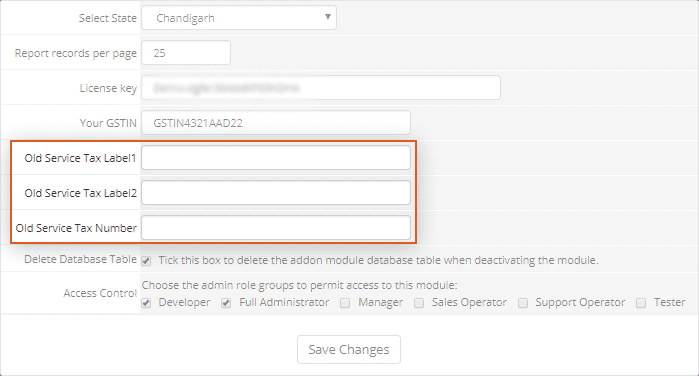 Amazing WHMCS GST Module. Folks are really helpful in providing the support, they helped us though Skype and Team-viewer also. Kuddos to Manvinder and Harpreet :) Thanks a lot guys. Keep up the good work. Nice GST Module & the Great Team to work with. I am glad to share that they don't stop listening post sales, as most companies do. Nice GST addon for indian customers. This addon is required for WHMCS users in india to meet the Tax needs for GST. 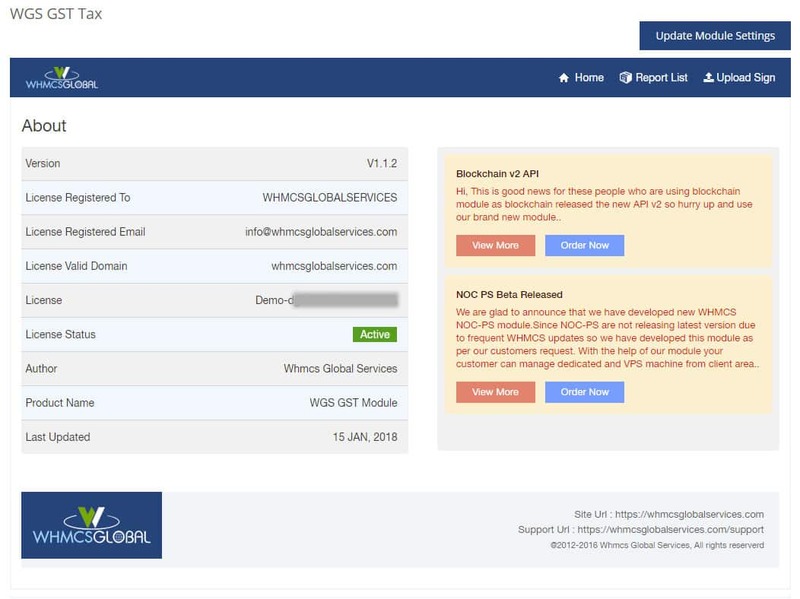 I have bought 2 licenses from WHMCSGlobalServices and the modules are working like a charm. Recommended! Hi Shashank as per discussion over phone i have sent you the product link. Free 7 Days trial was for initial release. Right now we are not providing the Trial licence. No more available on their website and seems taken down now/out of stock. It should be removed from WHMCS marketplace as well.. It is a good module. But perhaps their management and their policies are changed from what they were at the time I joined them last time. This is not free module. Although first reply was late, support person Mr. Harpreet was helpful to sort out issue promptly.